Audrey Mae (née Spencer) MacDonald’s (1912-2007) oral tradition begins with this couple, John and Susannah (née Griffin) Spencer. 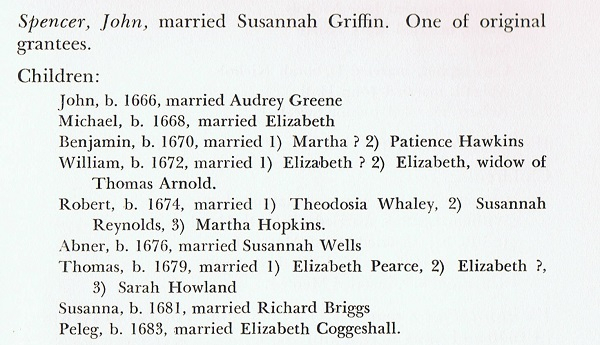 With John’s marriage to Susannah (aka Susanna), the Griffin ancestry came into the Spencer line. Susannah was the daughter of Robert Griffin. John and Susannah, originally of Newport, Rhode Island, became founders and early settlers of East Greenwich, Rhode Island in 1667. In 1677 John Spencer was granted land “in His Majesty’s Collony of Rhode Island and Providence Plantations” as recorded in the Act for the Incorporation of East Greenwich. John’s name was first on the list of the Act for the Incorporation of East Greenwich and he was the first town clerk in East Greenwich. He was granted land on Kenyon Avenue, between Division Road and First Avenue. He was also the first town clerk in East Greenwich. 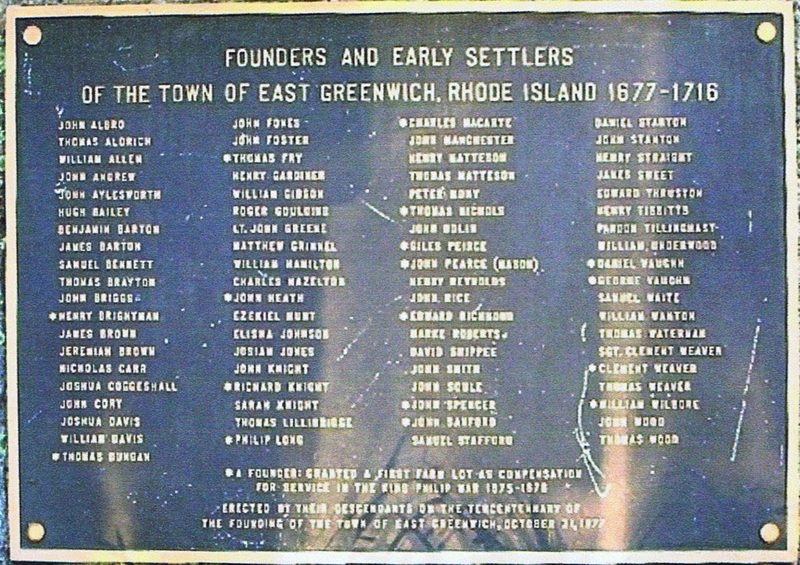 The pictured plaque attached to a boulder is located in front “of the former ‘old jail’, at the foot of King Street in East Greenwich, Rhode Island.” (source: internet) The asterisk (*) next to the person’s name means “a founder: Granted a first farm lot as compensation for service in the King Philip War 1675-1678″. (source: internet) John Spencer’s name is among the alphabetical list of names on the plaque attached to the Founders’ Stone. He was granted land by the King of England when East Greenwich was incorporated in 1677. John was a learned man. Early town records were in his handwriting. John and Susannah’s home, current day address is 289 Kenyon Avenue, was where the town meetings were held. 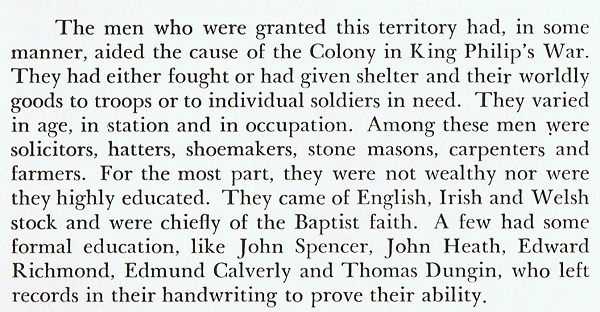 McPartland’s book The History of East Greenwich gives us the following information on John and Susannah. 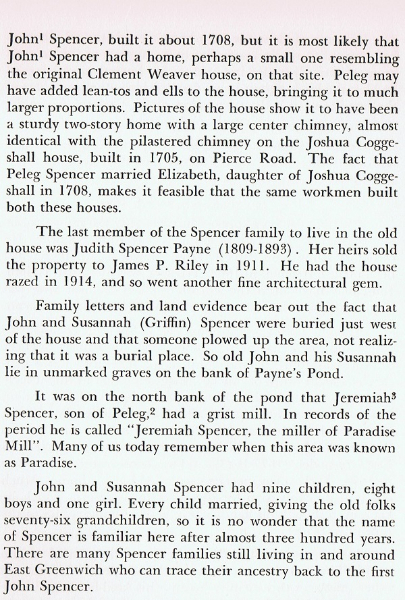 “John Spencer’s original ninety acre farm granted to him 1677 was on Kenyon Avenue. He evidently bought up other grants in this vicinity because his land-holding in the area were very extensive. His home stood on the ninety acre section assigned to him near Payne’s Pond. This house which stood on the site of the one by James McMahon today was torn down in 1914...The last member of the Spencer family to live in the old house was Judith Spencer Payne (1809-1893). Her heirs sold the property to James P. Riley in 1911. He had the house razed in 1914, and so went another fine architectural gem. Family letters and land evidence bear out the fact that John and Susannah (Griffin) Spencer were buried just west of the house and that someone plowed up the area, not realizing it was a burial place. So old John and his Susannah lie in unmarked graves on the bank of Payne’s Pond.” (M. McPartland “The History of East Greenwich, published 1960). Esther Amanda Briggs (aka E.A.B)(1835–1928), daughter of Richard Anthony (“Deacon”) and Roby (née Tarbox) Spencer, carried on the Spencer legacy as genealogist with her numerous notepad writing. Since paper was very valuable and nothing was every thrown away or wasted, almost every inch of the paper was used, often writing up and down around the edges and filling in any blank spaces. 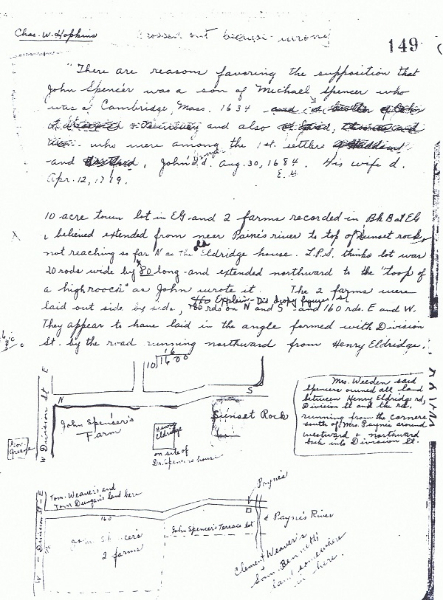 Page 149 of Aunt Mandy’s notebook gives a description of John and Susannah (née Griffin) Spencer’s property, as well as E.A.B.’s conjecture of John’s ancestry. The northwest corner of Kenyon and First Avenue has a very large rock which the ancestors called “sunset rock” because the ancestors could tell the time of day by the sun setting in the west behind the rock. 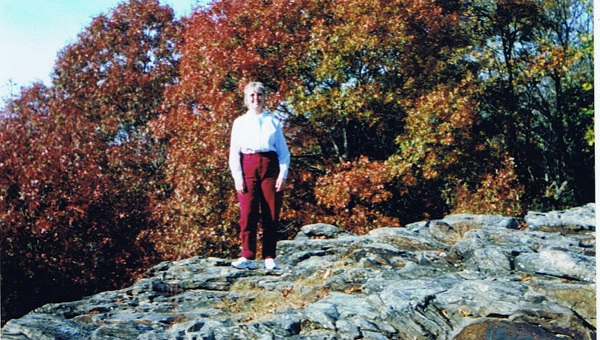 Audrey Mae stated that “sunset rock” was a landmark, like a fence, for the early colonials. “Sunset rock” was like a boundary line for the homestead of John and Susannah. Today, year 2009, the rock is hidden from Kenyon and First Avenue by beautiful green trees and bushes. However, the rock can still be reached by entering the back of the property of the Westminster Unitarian Church. Westminster Unitarian Church, 119 Kenyon Avenue, East Greenwich, overlooks the intersection of Route 401 and Kenyon Avenue. When these photos were taken in 2002, the tall trees to the west of “sunset rock” had been blocking the sun from the rock. The image of the sun setting in the west behind the huge rock is no longer evident. Therefore, “sunset rock” no longer describes the origin of the functional name for the rock coined by the early colonials. Outside researchers report that the John Spencer (c1638-1684), who married Susannah Griffin (1644-1719), is the son of Michael Spencer (1611-1653) and Isabel (née , -1674) Spencer. Michael Spencer’s parents were Gerard Spencer (1576-c1646) and Alice Whitbread (c1580-1646). Gerard and Alice were married in 1600. 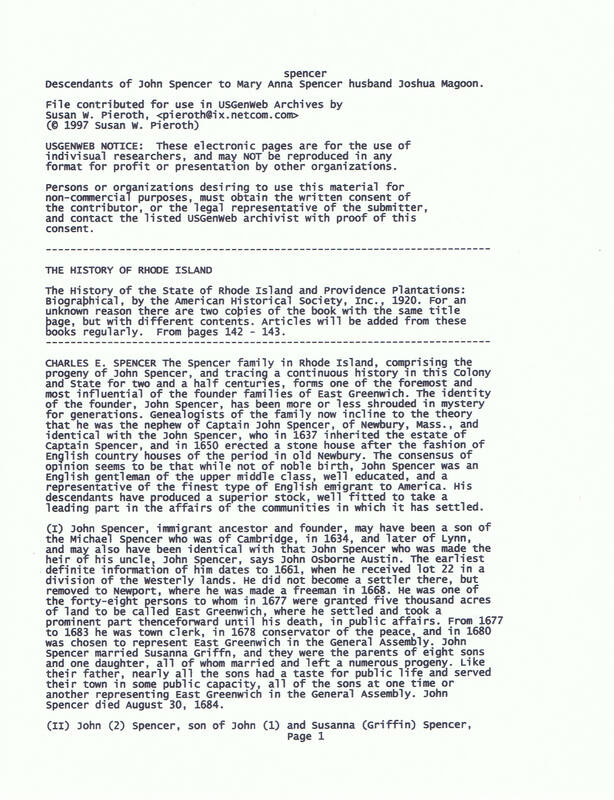 The references for this information is Flora Clark M/S “T1-02” and “M1-Part 1” NEHGS “Nexus” April/May 1990, Vol. VII, No.2. 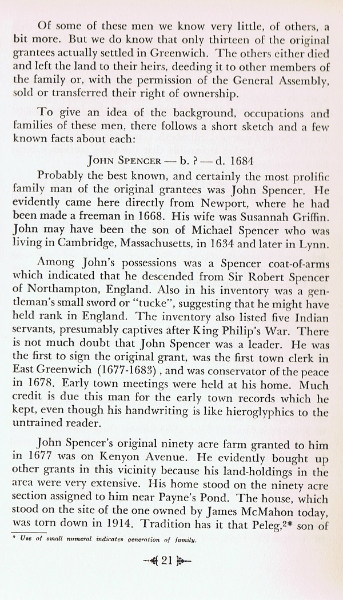 However, McPartland’s book The History of East Greenwich, Rhode Island gives the following information: “Among John’s possessions was a Spencer coat-of-arms which indicated that he descended from Sir Robert Spencer of Northampton, England.” More research is needed to substantiate John’s ancestry as Audrey Mae’s oral tradition, as well as written tradition, only went back to the first Spencers, John and Susannah, in East Greenwich, Rhode Island. Apparently, the Spencer ancestors were no longer interested in their English ancestry. They were, however, very proud of their Yankee history in the “New World”. John and Susannah (née Griffin) had eight sons and one daughter, all of whom grew up to adulthood! (Author’s note: This was very unusual at that time in history as the medical profession was very primitive, to say the least. There are many infants, children and teens in the historical cemeteries, but if a person lived through infancy and childhood, there was a good chance they would live a long life.) 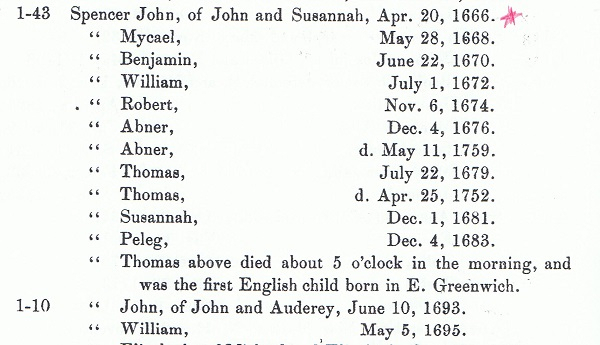 John and Susannah’s seventh son, Thomas, was the first English baby born in East Greenwich, in the Colony of Rhode Island and Providence Plantations. 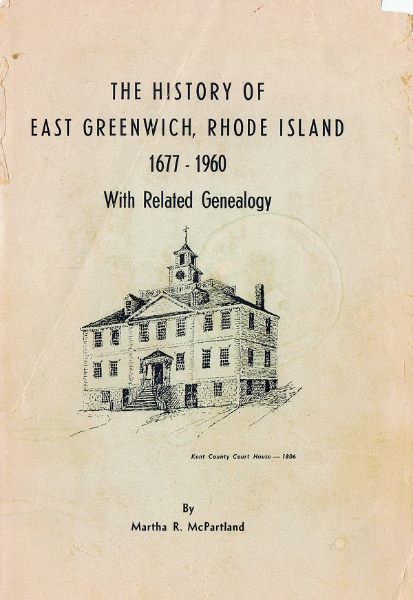 Page 269 “The History of East Greenwich, Rhode Island 1677-1960” by Martha R. McPartland gives us additional information on the nine children of John and Susannah. An amusing but thought-provoking story told by Audrey Mae on a 2001 phone conversation is as follows: “Thomas, the seventh son of John and Susannah, was a doctor. However, he had no formal education. He was supposed to be gifted. An old wives tale or legend is ‘If you had seven sons, the seventh is gifted’. ” Audrey Mae also mentioned that her granddaughter, Amber, recently had her picture taken in Thomas’ house in the center of the historical section of East Greenwich. Edith Anna, John Edward (“Ed”) and Audrey Mae descend from John, the second generation Spencer in E.G., mentioned above. John is the oldest brother of Thomas and Susannah. 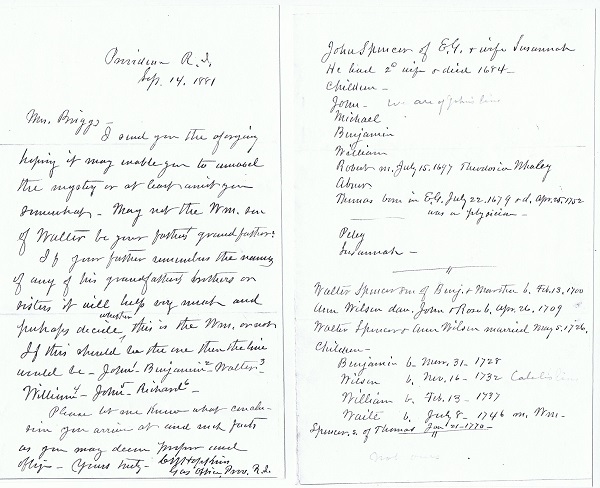 A letter written to Esther Amanda (née Spencer) Briggs in 1881 from an office in Providence is still in the Spencer family descendants’ files. Esther (aka “Aunt Mandy”), the great-great aunt of Audrey Mae, John Edward (“Ed”) and Edith Anna, was the Spencer historian for her generation. 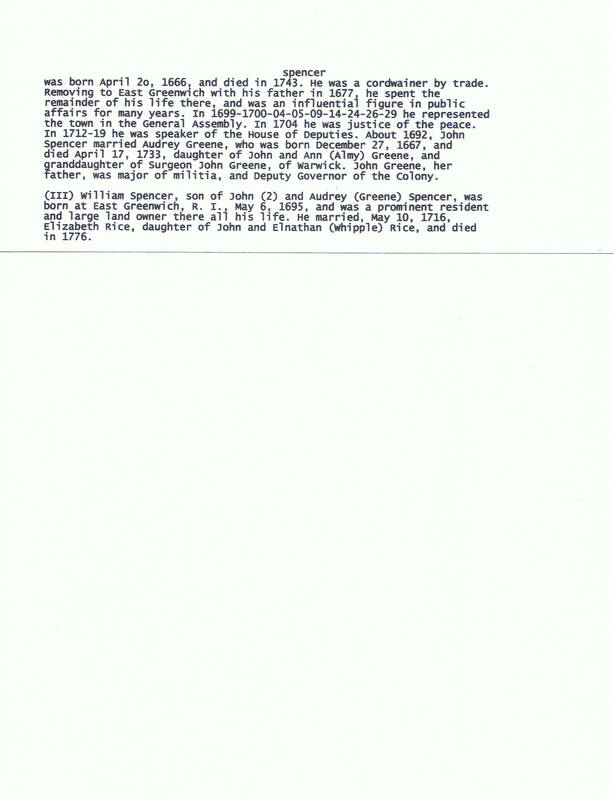 More research is needed to determine the letter writer and the contents of following letter, but included below because the letter gives another listing of John and Susannah’s eight sons and one daughter. Whereas Audrey Mae was named after her Greene ancestor, Audrey Mae’s older brother, John Edward (“Ed”) Spencer (b.8-15-1904—d.4-26-1988) was named after this first John Spencer in East Greenwich, Rhode Island. In Audrey Mae’s direct line, the Founder John’s son, great great-grandson and his great (7 times) grandson were named after him. Audrey Mae has no descendants who have the name John, but Edith Anna, Audrey Mae’s older sister, has a grandson named John and a great-grandson named Spencer. Audrey has a son named Spencer and has a grandson with the middle name of Spencer. John, as well as the Spencer name, is still alive with the Spencer descendants in the 21st century. In the 1950s, one of Audrey Mae’s daughter’s history school textbooks referred to Rhode Island as “the traditional home of the other-wise minded”. 🙂 (Author’s note: Does this mean Rhode Islanders were (are) independent thinkers, anti-royalist and nonconformist? Perhaps, but this Spencer is not an anti-royalist because of the legacy of Princess Diana (née Spencer). Was their still some animosity because of the American Revolution? Our ancestor fought the British as “a minuteman” in the Revolutionary War. Would the fact that Martha McPartland’s book mentions that in John’s possessions was “a Spencer coat-of-arms” and “a gentleman’s small sword or “tucke”, suggesting that he might have held rank in England.” have something to do with William J.B. Spencer’s strong reaction to his young granddaughter’s comment? 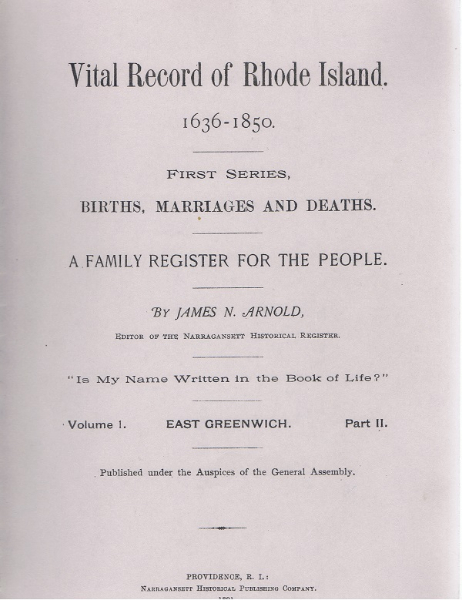 “Rhode Island Colonial Conditions: In none of the American colonies was the democratic sentiment so intense as in Rhode Island, where all marks of rank and distinction were early repudiated and persistently ignored with a popular unanimity and vigor that has imbued the descendants of Rhode Island families with a deep seated repugnance to every form of hereditary pretension, a feeling that in some instances is carried to rediculous (sic) extremes. 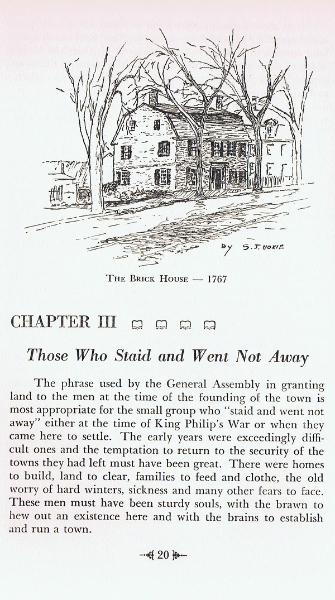 … The general indifference to the subject accounts doubtless for the inattention and neglect with which the Spencer coat of arms has been treated, which tradition says belonged to him and which are now time stained and crumbling.” page 24, Robert C. Spencer’s Spencer Family History and Genealogy. This entry was posted in Audrey's blood relatives Spencer line, Burial Place, Generations and tagged John and Susannah on November 18, 2012 by Heather.